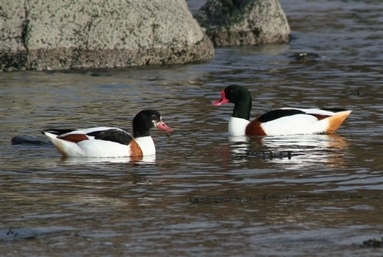 From November until July, Shelducks are familiar ducks around the coast of Arran. They are significantly bigger and more goose-like than other ducks. The males and females have similar plumage, whereas, in most ducks, the females are less colourful making them less conspicuous when sitting on nests. Shelducks nest in burrows, often old rabbit burrows, so the need for the female to be camouflaged is less significant. Indeed, adults are conspicuously black and white with an orange band around their chest. At the base of the bill the male has a red knob. Juvenile plumage is more brown and white and they lack this orange chest band. But where do our Shelducks go between July and November? Like other ducks after breeding, Shelducks moult their feathers. All Shelducks, except those bred during the year, need to renew wing and tail feathers simultaneously. For about four weeks they are unable to fly at all. During this stage they are very vulnerable, and to deal with this the Shelducks gather together before their moult, often in enormous concentrations. The most famous one is the German Waddenzee, reaching over 180,000 birds and including most of the north-west European population: from Britain, Ireland, Belgium, Holland, Denmark, Scandinavia, north Germany, north Poland and the Baltic States. The Waddenzee consists of many square miles of gently shelving sand and mudbanks. Smaller moult sites include the Firth of Forth and the Wash. This moult migration starts as early as July with non-breeding adult birds heading off across the North Sea. In the breeding areas, Shelduck broods readily unite to form packs of young birds with only a very few adults in attendance. Breeding adults then also migrate. Late arrivals in the moult area in August/September are birds which perhaps have delayed migrating until the young they have cared for are independent. When the birds have completed their moult, the migration back to their breeding areas begins with Shelduck returning to Arran usually in November. Look out for their return this year.